Brussels:The 40b40 movement received a potentially damaging blow to its reputation at the weekend as “concerned supporters” protested the absence of two essential names from the project’s proposed list of beers. 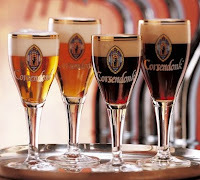 Both Corsendonk Pater and Corsendonk Angus, two leading brews from the Corsendonk brewery, were not on the 40b40 list, leading to unrest even within the movement. “As much as I respect both the project and the driving forces behind it, I have to voice my concern at the missing Corsendonk Pater and Corsendonk Agnus from your list”, demonstrators shouted in unison outside the gates of the 40b40 headquarters on Saturday. “I will be expecting to hear your arguments”, they raged. Andrew, Competing Athlete for 40b40, could not initially be reached for comment but on Sunday said he had met with representatives of the dissenting group. He revealed that, as a goodwill measure ahead of planned crisis negotiations on Wednesday, he had provisionally added the two beers to the 40b40 group. Indeed, controversy had been brewing for some time, because the supposedly 40-beer list already had 44 brands on it before this weekend’s dispute brought it to 46. Now, with six beers needing to be cut, advocates are already pressing for their favourites to remain -- and threatening severe consequences if they fail to make the cut. “If they drop Orval, I will pull my sponsorship of 40b40”, said one insider who asked not to be named. Andrew said he was hopeful the issue over what many are now calling “The Corsendonk Two” could be resolved “within days”, but he refused to give an exact timeline for the final selection of the 40. In a related development, the 40b40 project named Sebastien as its new Trappist and Regional Brewery Analyst. He is expected to join the crisis talks on 21 November. Andrew refused to either confirm or deny rumours that the reason for his initial tardy response to the crisis was a direct consequence of his drinking of Dutch beers at the weekend. This blog has learned, however, that Belgian investigators are now looking into whether a crime has been committed.